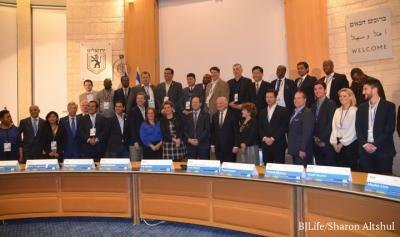 Jerusalem, Israel - Feb. 12, 2018 - The 32nd Annual International Mayors Conference in Jerusalem, Israel, opened on Sunday evening, February 11, in the Jerusalem City Council Hall Chambers at Kikar Safra. Mayors attending including Dinant, Belgium; Cochabamba, Bolivia; El Alto, Bolivia; Botswana; Port Alegre, Brazil; Limbe, Cameroon;Prague, Czech Republic;San Salvador, El Salvador; Addis Ababa, Ethiopia;Kutaisi City, Georgia; Piraeus, Greece; Prishtina, Kosova; Luxembourg; Lilongwe, Malawi; Mdina, Malta; Kathmandu, Nepal; Encarnacion, Paraguay; Rimac, Peru; Poznan, Poland;Taichung, Taiwan; Zanzibar, Tanzania; Dnipro, Ukraine; Kampala City, Uganda; and from US, Torrance, California; Bal Harbour, Florida; Miami, Florida; Sandy Springs, Georgia; Rochester Hills, Michigan; Warwick, Rhode Island;and Chattanooga, Tennessee. The event featured remarks by Jerusalem Mayor Nir Barkat and Jack Rosen, President and Chairman of the American Jewish Congress. The speeches were in English. Translators were provided for the mayors in languages including, French, Spanish, Portuguese and Russian. It was a second trip to Israel for the Mayor of Piraeus, Greece, but for many the conference was their first chance to see Jerusalem. Mayor Chia-Lung Lin from Taichung City, Taiwan had a group of businessmen accompany him, hoping to make good contacts over the week long conference. Barkat mentioned his focus on startups in Jerusalem, with 600 today, up from 250 a few years ago. Tourism and culture are another area of focus. The Jerusalem Marathon is expected to attract 30,000 participants this year. As for security, Barkat told the other mayors, Jerusalem is one of the safest cities in the world, but under a huge magnifying glass. Including crime and terror, only 1 out of 100,000 people on average are killed, a number lower than most cities. Prayer in Jerusalem, said its Mayor, "is a local call." At the conclusion of the formal program, the mayors were taken to see and enjoy Jerusalem night life.